Baby Shower cake, Reunion cake, Holiday cake and Corporate Event cakes Chocolate Fountains and Sweet Tables etc. We believe that every customer and occasion is unique. That’s why, we specialize in customization. Whether it’s a small get together or your special wedding day, we are committed to making your special day a memorable event. All our chefs are highly qualified and experienced. They know how to blend the best flavors and colors to tempt your taste buds. A cake is the centerpieces of every occasion, especially when it’s a wedding or birthday. 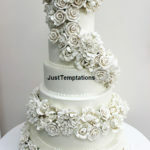 The wedding and birthday cakes we offer in Richmond Hill aren’t any ordinary cakes, rather they are work of art. We strive to give the perfect shape, color and taste to your visualization. You can’t trust this moment to just anyone. We have years of experience in this field and know how to add that WOW factor to your occasion. Just tell us what shape, size, design, color and flavor you want, we will customize your cake as per your requirements, taste and occasion. Our master chefs can transform your dream cake into a reality. Have a look at our gallery to explore the design options. We offer an array of designs in different flavors, the sky’s the limit for our talented chefs. 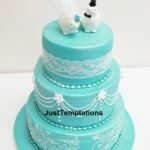 Your one-of-a-kind wedding/birthday or any other occasion cake is created by experienced and professional pastry chefs in Richmond Hill. 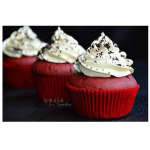 The cake will be sumptuous and luscious with the exact flavors and decoration. We use only quality and organic ingredients. And they are always fresh and specifically chosen to enhance the flavors. 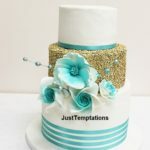 Whether it’s a beautiful wedding cake, christening cake or a fun birthday cake, Just Temptations will create the ultimate handmade centerpiece for any special occasion. We promise to bring joy to you and your guests. Get beautifully hand crafted cakes, pastries and cupcakes in Richmond Hill.